C639R LUGER AMERICAN EAGLE 30 CAL. 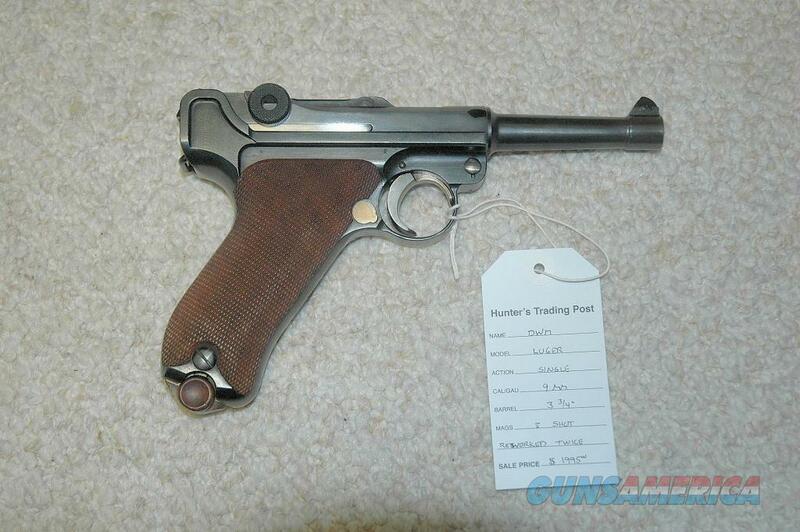 Description: This is a nice DWM Luger for sale chambered in 7.65MM The barrel length is 3.75 inches long and this comes with 1 matching magazine. All of the parts that are numbered do match, but this gun was reworked at some point by DWM or Simpson. The first rework a 7.65 barrel was installed with original sight retained. The stock lug and external numbers were grounded off except for the frame. The pistol was factory rust blued, straw parts were re colored. The correct clip is with gun, but the serial number stamp was added. The grips screws and rear toggle pin are original military factory light blue. Second refinish was sent back to the factory for repair, especially the hold open pin replacement. Many of the parts were then stamped with the last 2 digits of the serial number. The gun was rust blued again and straw parts were lightly buffed. This gun is for sale in my retail store and could be sold while the ad is active. Please ask for more pictures if needed. NO CC Fees Layaway Terms 60 days with 20% down non-refundable after 15 days.